Description of "Facts For You (eBook)"
This is the only EFY product that focuses on non-technical matters. The magazine updates top decision-makers in the Indian industry on the Indian economy, through its incisive market surveys and detailed articles on India’s banking industry, employment trends, industrial growth, and so on. 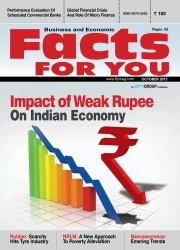 It aims to keep its readers informed on India’s economic trends, including foreign trade. Reviews of "Facts For You (eBook)"